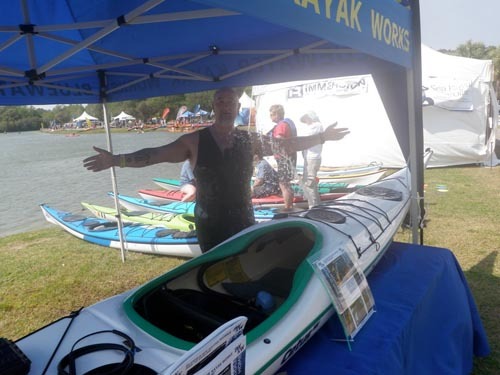 Last Wednesday I hopped on a plane to Charleston, South Carolina for the 21st annual East Coast Canoe and Kayak Festival. It was my first time attending this event and I was greeted by friendly people, warm sun and incredible food. 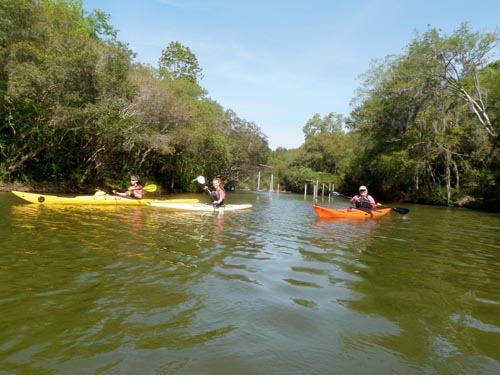 The event takes place at the James Island County Park, which resembles a resort with its water park, climbing wall and playgrounds, and I stayed in one of the charming cottages on the property. 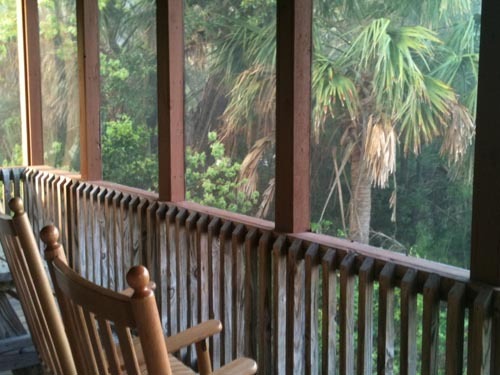 I soon felt like I was in paradise as I stretched out in a rocking chair on the porch to watch a Cardinal flit from tree to tree in the surrounding marsh. The Park is huge, and a bike provided transportation from the cottages to the dining hall, to the lake where classes took place all weekend. 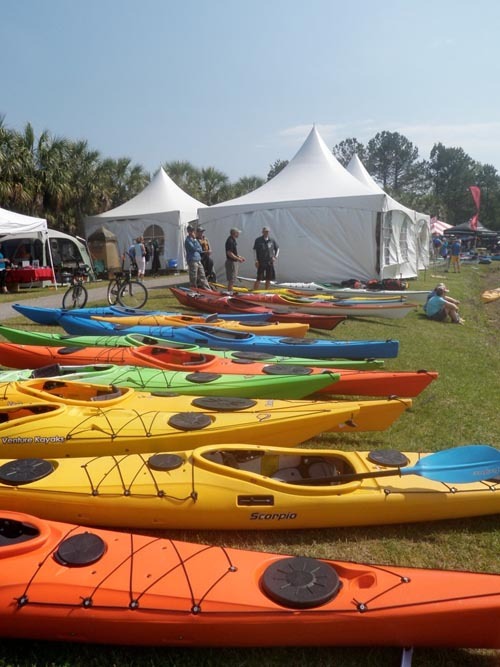 Vendors lined the shore, and it was great to chat with local outfitters at their booths, as well as others in the outdoor industry, such as Kokatat, P&H, Outdoor Research and Qajaq USA. Kayaks, kayaks and more kayaks. Bob Burnett demonstrating the easy way to empty a kayak. 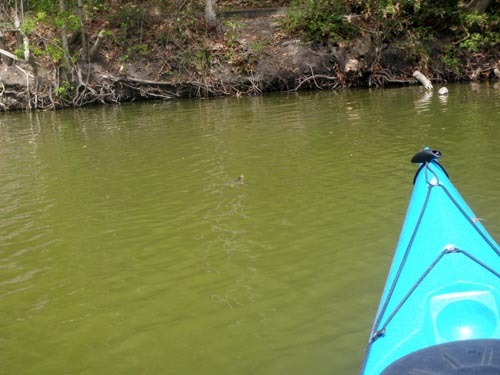 Participants tried out kayaks while watching for turtles that swam around in the warm water. Both on-land and on-water classes took place throughout the weekend, and I had a blast instructing my classes as well as jumping in to work with other instructors. I also tried a stand up paddleboard for the first time, and had tons of fun figuring out how to maneuver the thing. Alligators... I looked, but I didn't see any. Evenings were filled with conversation, beer, delicious food and socializing, as well as a Friday evening presentation on Greenland and a Saturday evening on-water presentation put on by the instructors. Throughout the weekend I saw many people smiling as they loaded new kayaks and gear onto their cars, heard lots of people talking about the skills that they’d learned and listened to people comment that this event often feels like the beginning of kayaking season… and I think I have to agree. 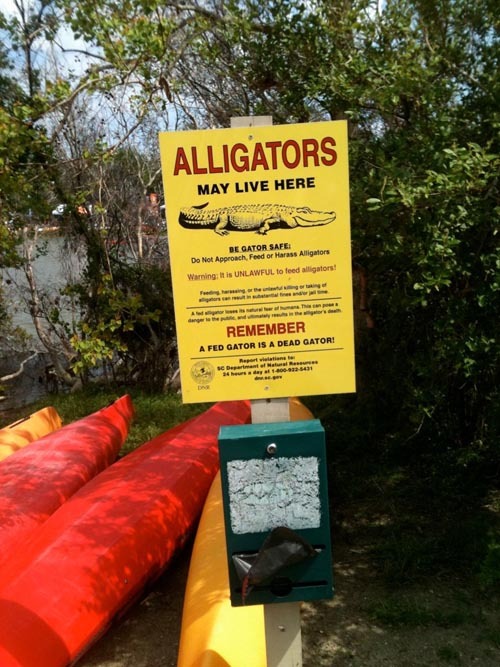 Of course you didn’t see any alligators, Wellen. The word is out. My educated guess is that it took about a week for the cagey reptiles in the Charleston area to get the “low-down from their crocodilian cousins out West about what happened at the Golden Gate Sea Kayaking Symposium. No point in tryin’ to “chow down” when Helen’s aroun’.